The Quebec government will help support a feasibility study to examine McGill’s proposal to develop the soon-to-be-vacant Royal Victoria Hospital into modern academic and research space, a forum on major Montreal projects was told Friday. Robert Poëti, Minister of Transport and Minister for the Montreal Region, told the forum sponsored by the Chambre de Commerce du Montréal Métropolitain/Board of Trade of Metropolitan Montreal, that the government will work with McGill to launch what is expected to be a $8-million, year-long study of a project that could cost about $800 million by the time it’s completed in 2021-22, coinciding with McGill’s 200th anniversary. The government will contribute $4 million to the study, while McGill will contribute the remaining amount. Principal Suzanne Fortier and Olivier Marcil, Vice-Principal (Communications and External Relations) presented the project to the forum first thing Friday morning and showed a video (see below) outlining McGill’s vision for the old hospital’s future use. Prof. Fortier said McGill’s project, which would use about 700,000 square feet of space, is vital for a university suffering a substantial space deficit. As well, she said, McGill and the Vic share considerable history and the location is a natural extension of the University’s downtown campus. Under McGill’s current proposal, some buildings with little or no heritage value, would be demolished and, without adding to the footprint on Mount Royal, be replaced by modern, less-intrusive structures that would provide state-of-the-art teaching and research space. Acquiring the Royal Vic could also provide McGill with an opportunity to build the large, modern auditorium, suitable for events like Convocation, that it has sought for years. Prof. Fortier noted that McGill’s plans for the Royal Vic not only address academic needs, but also serve the interests of the Montreal community. Marcil said he was thoroughly pleased with the response to the project at the Chambre de Commerce event. “It was very positive,” he said in an interview after the presentation. “I think people appreciate the fact we’re offering to provide more green space on the site, better access to Mount Royal for the general public, and have the heritage buildings preserved and used in a way that is appropriate to their original vocation. In an interview with The Reporter last year, Provost Anthony C. Masi outlined some of the advantages for McGill. I am curious to know where the money to operate and maintain the site will come if this project goes through as we do not have the resources to properly maintain the current space we have. Getting the 800 million to build and renovate is one thing. What about afterwards? Could you be a bit more specific about what you mean by “modern academic and research space”? What is really going to happen there? I’m curious why the feasibility study will cost $8 million. I admit I am completely naïve about such things, so I am genuinely curious, but I am also a bit shocked. It’s a one year study, so if you paid 100 people to work on it full time, they would each make $80,000. Is there really such a large group working on this? Or are we paying through the nose for a much smaller group of individuals? Or are there other costs? It would be nice if you filled in latecomers on why the Royal Vic space is being vacated in the first place. Cosmopolitan journalism routinely provides the historical background obvious to the locals. 1.There is a dire need for long term chronic care facilities. Couldn’t at least part of the Vic be used for this purpose? 2.What is meant by, ‘the modern way of thinking about learning spaces’? Now there’s imagination! What an impressive site for a world class university. Good luck! McGill should be first in line as many medical students of McGill have worked at the hospital and the mcgill health center is part of Royal Vic. 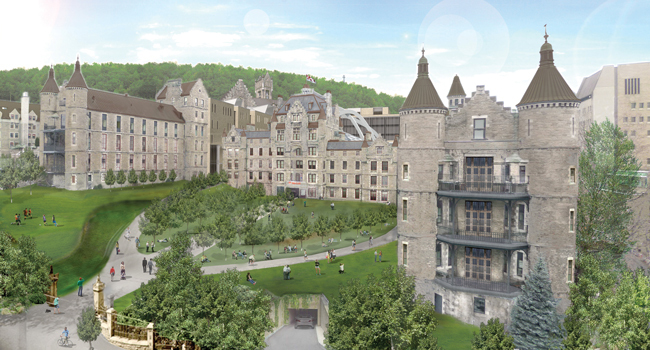 The grounds are so close to McGill that by including the RVH as part of McGill will keep the heritage alive and add much needed space for the university. This can’t be lost to a condo developer for profit. This land must go to McGill and might even allow McGill to sell off some of their off campus buildings to developers. This part of Mont-Royal will keep it’s beautiful look and fit in with the old McGill campuses. The royal vic has been an English language hospital and has seen many ex mcgill alumni pass through the halls and will still be able to keep that beautifull Gothic look for years to come under the red and whit banner of a great canadian university. Can’t wait to visit the new grounds when completed.